Raheem Sterling scored has made it 6-0 to Manchester City against Chelsea, Pep Guardiola’s side have easily broke down the Blues today at every opportunity. 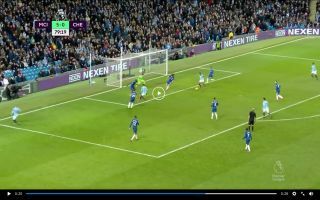 In the 80th minute of the match, Gabriel Jesus tricked his way past Cesar Azpilicueta and Ruben Loftus-Cheek before lobbing the ball into David Silva. City’s magician played a pinpoint pass into Oleksandr Zinchenko which split Chelsea’s defence for the umpteenth time today and the Ukrainian played a low cross into the centre of the box, which was tapped in by Sterling. #Mancity 6-0 #Chelsea #Sterling ??? Liverpool may be quaking in their boots after seeing how City have destroyed Chelsea this afternoon.